John Knox was approximately 42 years of age. We don’t know when this future Reformer saw the light of the Reformed faith, but George Wishart likely had something to do with it. Knox had been his body-guard as Wishart powerfully preached the gospel throughout Scotland. When the latter was martyred, Knox in time became a religious tutor to three children—two sons of Hugh Douglas of Longniddry, as well as the son of John Cockburn of Ormiston. The two fathers, Douglas and Cockburn, had embraced the truths of the Reformation, and desired their children to be taught of Knox. 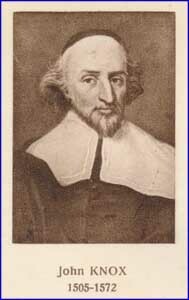 So, not only in elementary truths like grammar, but also in Scriptural readings and catechising, Knox led his young pupils as he stayed in their homes. When it became evident that Knox became more and more a marked man by the Roman Catholic authorities, the parents urged Knox to take their children into St. Andrews Castle, where a number of people had fled for their lives. 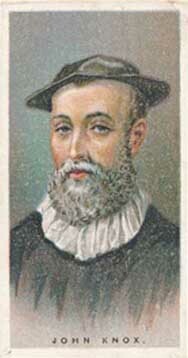 It was on April 10, 1547 that John Knox arrived at St. Andrews Castle with his three pupils. It is recorded that he began at the same place in their instruction that he had left off in the home of their parents. Their names, for the record, were Francis Douglas, George Douglas, and Alexander Cockburn. Soon that private tutoring became known to the Protestant pastor of the congregation now gathered in the castle, the Rev. John Rough. He came to Knox and urged him to take on what we would call today an associate pastor’s position, as Rough was weary in the work. Knox turned him down flat, saying that he would not do anything without a lawful calling from God. The future Reformer left the worship time in tears and spent many days and night in grief and trouble of heart. Eventually, he came to believe that the call came from God. His first sermon was in the parish church of St. Andrews, where he took as his text that of Daniel 7:24, 25. Laying open the false doctrine of the Roman Catholic Church, he compared their justification by works with the justification by faith alone as expressed in the Word of God. The hearers said that while others lop off the branches of Romanism, Knox had struck at the root to destroy the whole. 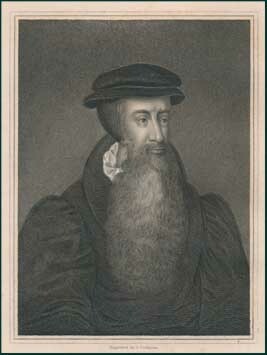 The author of The History of the Church of Scotland, W. M. Hetherington, writes on page 34 that such preaching by Knox was the real beginning of the Reformation in Scotland. From that time forth, no appeal was made by the Reformers to any other standard except the Word of God. Yet before John Knox could move on in his fledgling ministry to declare the unsearchable riches of the gospel, the castle was attacked and captured by French naval forces, and forced to surrender on July 31 of the same year. Knox would spend the next 19 months as a galley-slave on a French ship, which we will consider in a future post. Image sources: Three different conceptions of what John Knox looked like. The first is a bit “unorthodox”—an image from a cigarette trading card, specifically, Ogden’s “Leaders of Men” series, no. 27, issued in 1924. The second is from a postcard bearing only the attribution “A. H., édit.” to designate the publisher. Both cards are among a small collection preserved at the PCA Historical Center. The last portrait of John Knox, shown at right, is the more traditionally known image. Quite the beard there, eh?